Certain stories happen by chance, others are born of intuition. 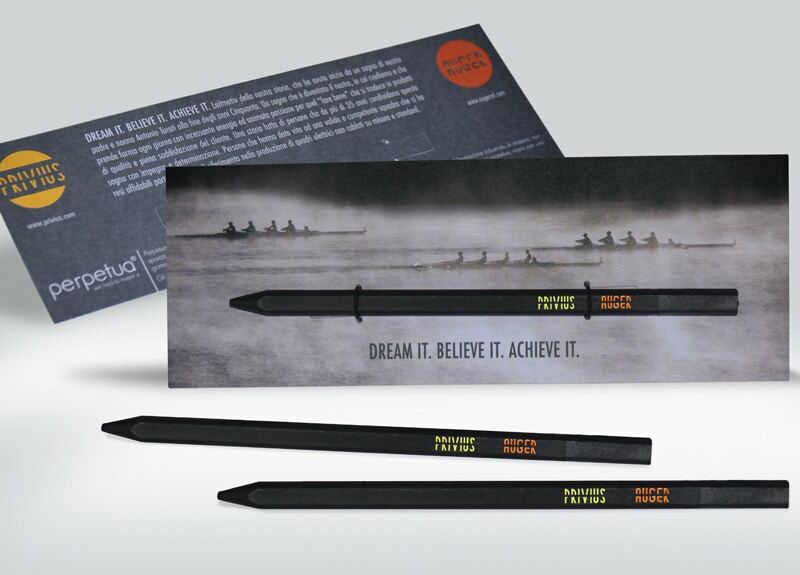 Despite not being able to find a pencil manufacturer who would listen to us, at Alisea we were fascinated by this project. We formed a work group comprising two experts, one in materials and moulding, the other in automation, and two designers: together we made our dream come true. 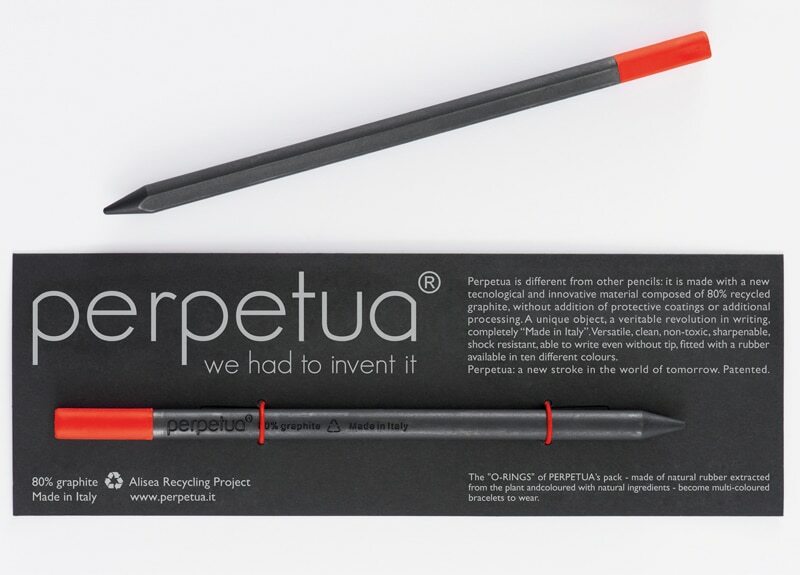 The result was PERPETUA, a pencil made of 80% recycled graphite. 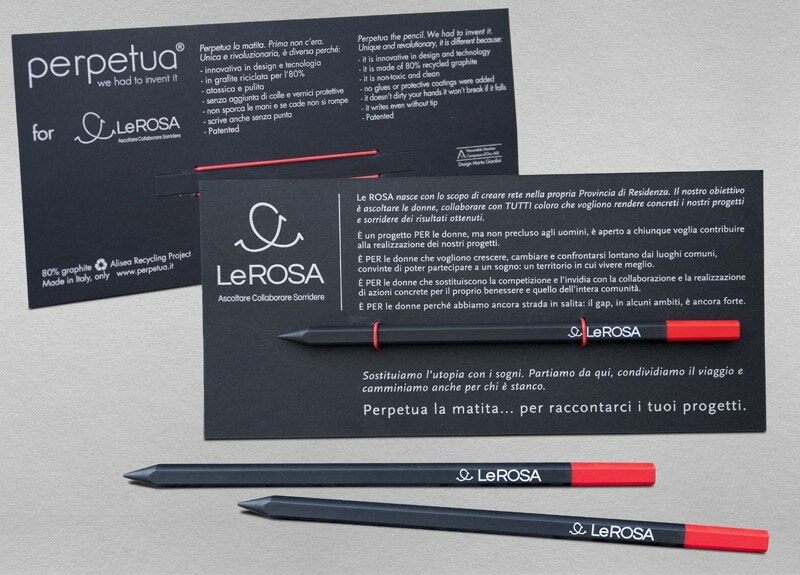 PERPETUA® is designed by Marta Giardini. Disposing of it while writing: unique intuition turns into inventing research in how to use tons of graphite powder, a waste of industrial production, otherwise destined to be put underground. 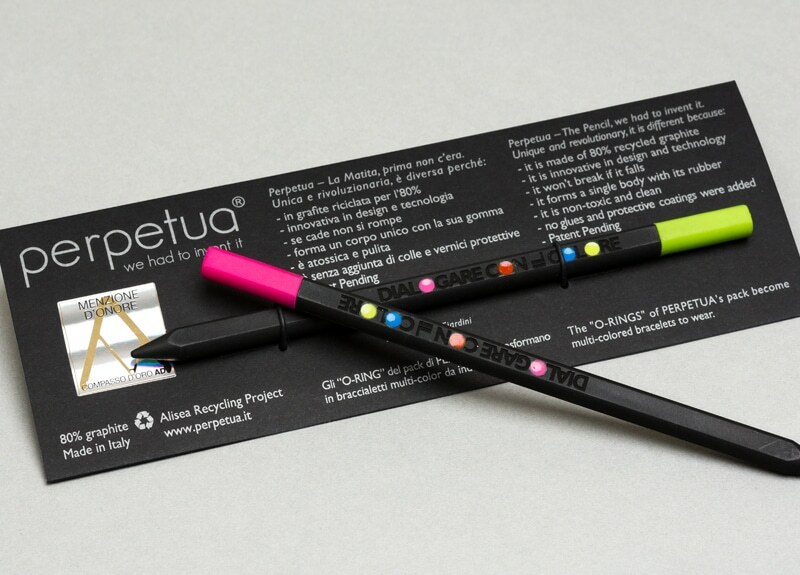 While writing, you are disposing of Perpetua’s 15 grams of graphite. 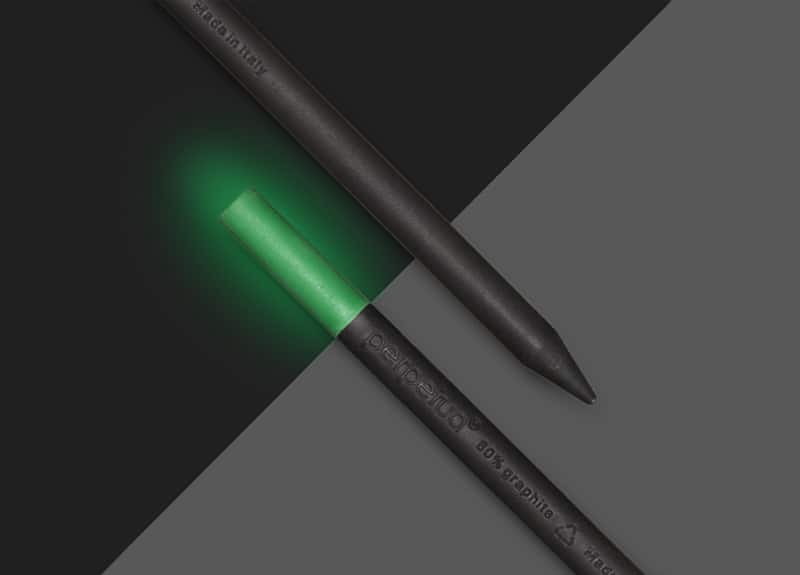 In fact, its exclusive production technology makes the traditional wood casing unnecessary: an eco-sustainable system which reminds us that trees must be cut down in order to make standard pencils. Thus, Perpetua is not only a new style of writing, but also a new style of living, respecting the planet and being aware that small actions can make a big difference. Perpetua has a flat side that prevents it from rolling away. Its eraser is available in 10 colors and forms a single body with the writing part. It’s 19.5 cm (7.68 in) long and has a diameter of 9 mm (0.35 in). 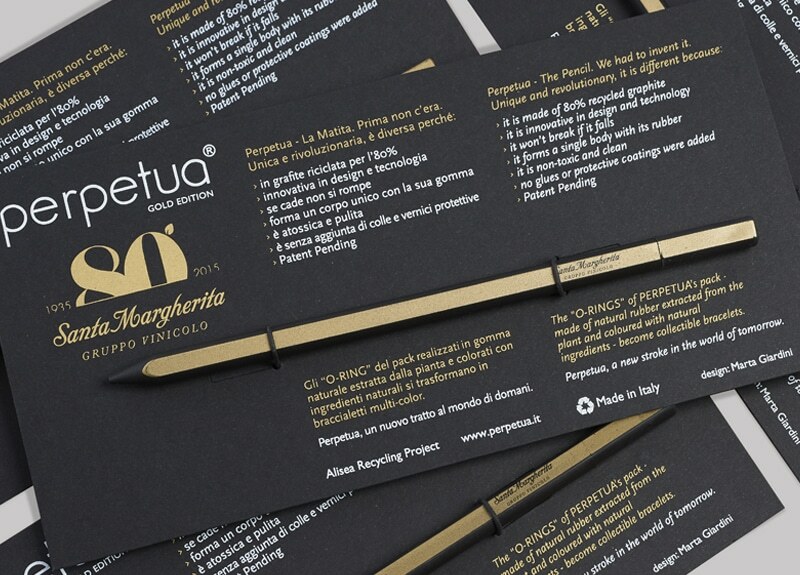 Its exclusive packaging tells you about Perpetua’s story. 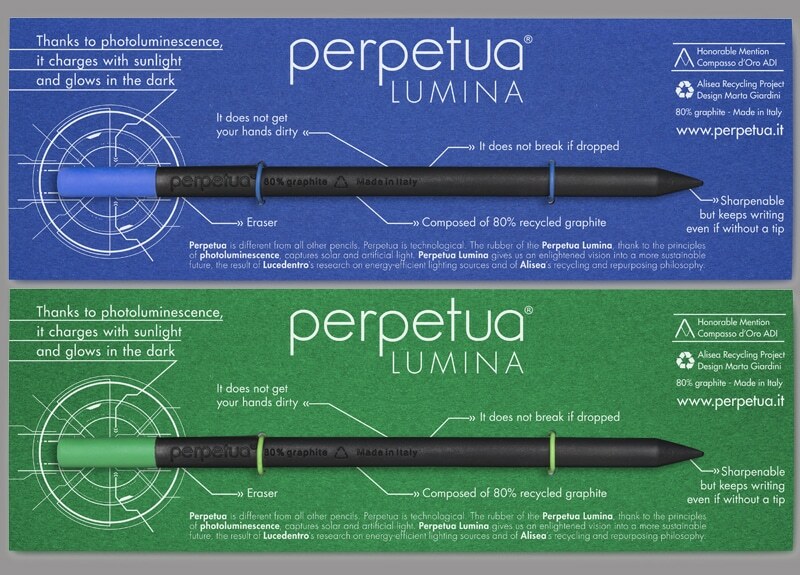 You can find Perpetua in the best writing supplies stores. 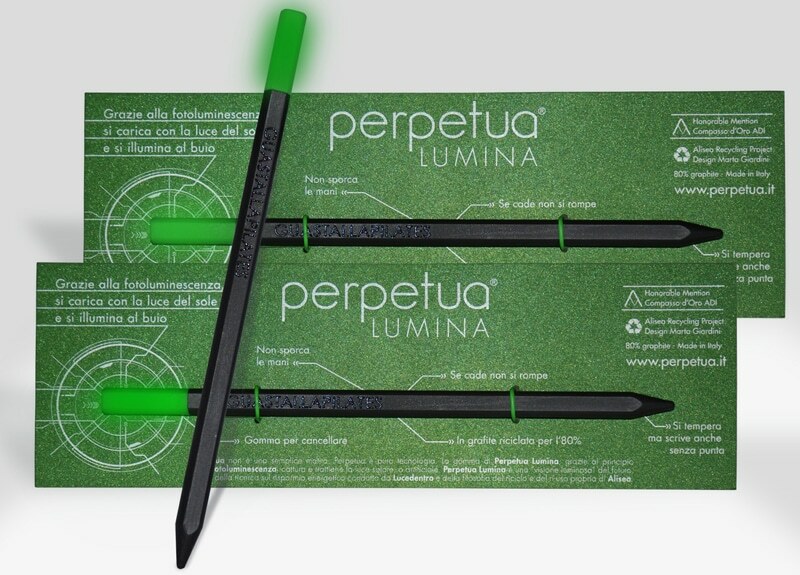 The Perpetua Lumina rubber captures and retains the sunlight and then shines in the dark with a progressively decreasing intensity. A charming and magical fluorescent light either blue or green, one that accompanies the hours of the night: an original detail for adults, a friend against the fear of the dark for the little ones. 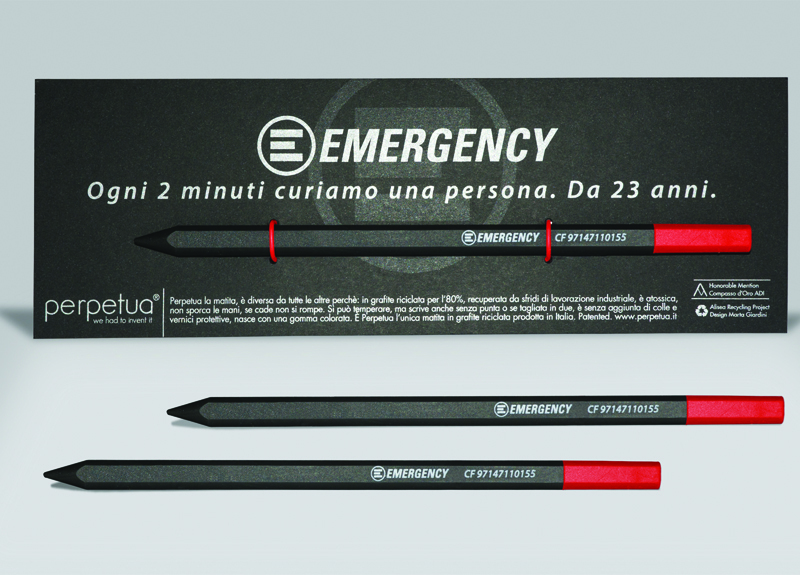 Perpetua was chosen by Emergency for its Christmas shops, to sustain their activities around the world. Exclusive edition for the prestigious Guggenheim museum in Bilbao, available from 2017 in its concept store. Guastalla Pilates is a unique Pilates studio. 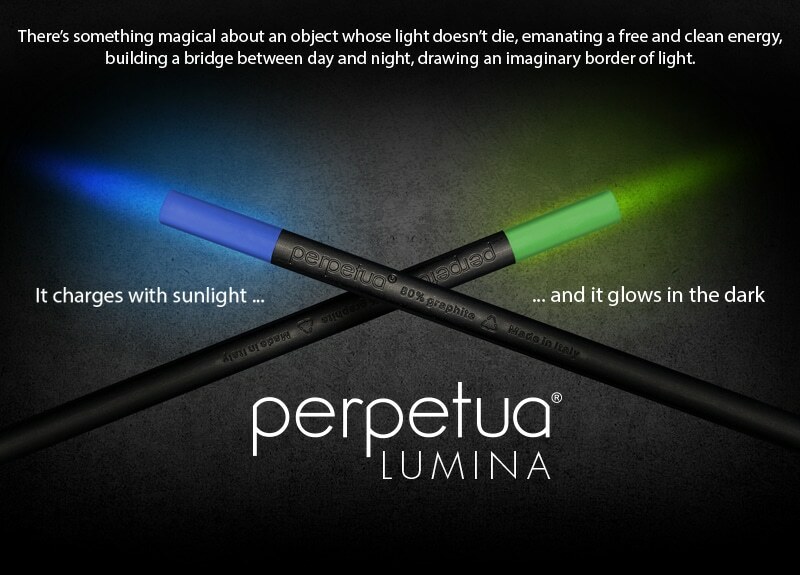 It has been decided to gift all its customers with a personalized Perpetua Lumina with laser engraving, adding a black glaze to make Perpetua even more unique. 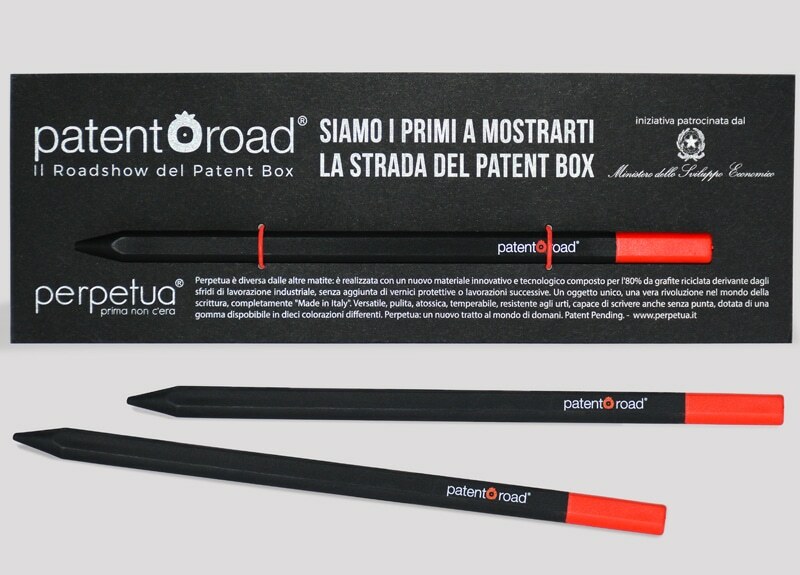 Technetic Italy, sponsored by the Ministry of Economic Development, has chosen Perpetua as its testimonial for its information tour of the law “Patent Box”. Perpetua, chosen for the Grand opening of the Arclinea Hong Kong Showroom, the leader in Italian Kitchen design and technology. “Everything in the world must be colourful” – this sentence by Giò Ponti inspires “Dialogare con il Colore”, the event organized by ColorColoris. 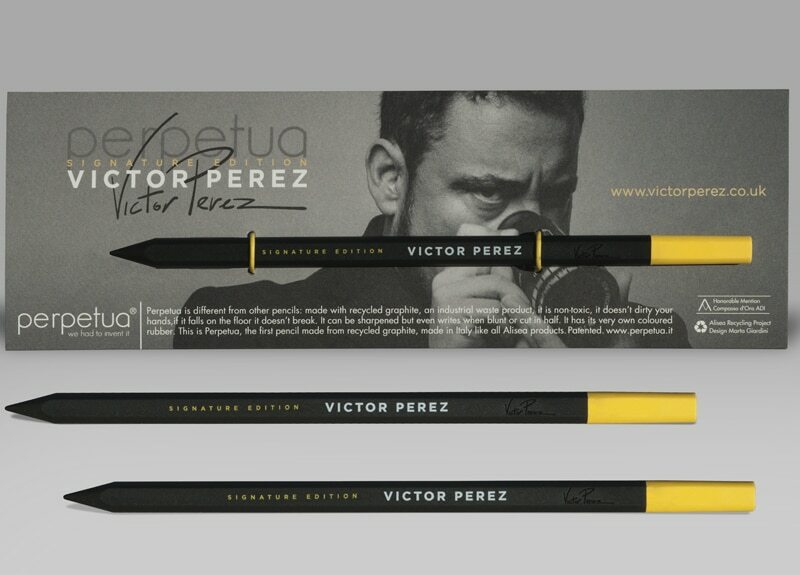 Example of packaging printed in four-color both front and back, Perpetua customized in 2 colors, yellow and orange. 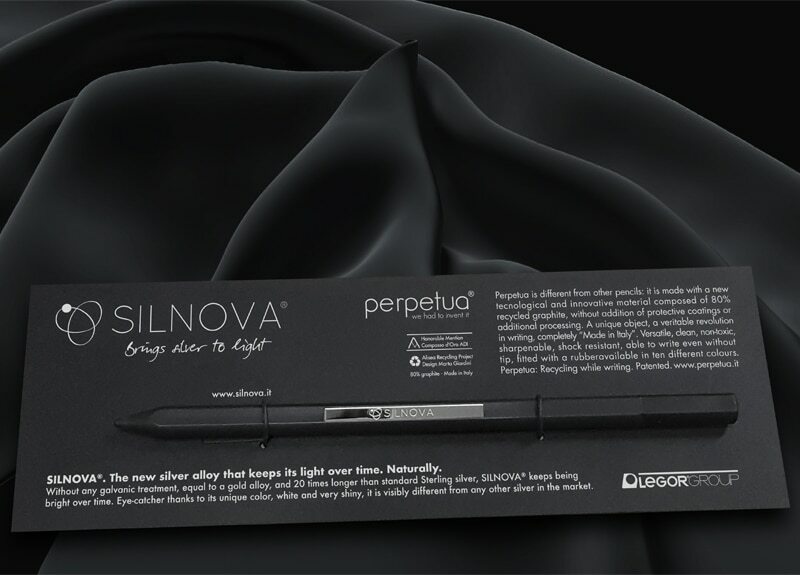 Silnova and Perpetua The Pencil, a brilliant innovation. Legor Group chooses Perpetua We Had To Invent It, as a messenger to present SILNOVA to the world, its new innovative silver alloy. Perpetua, chosen by the Santa Margherita Wine Group on the occasion of the 80th anniversary celebrations. 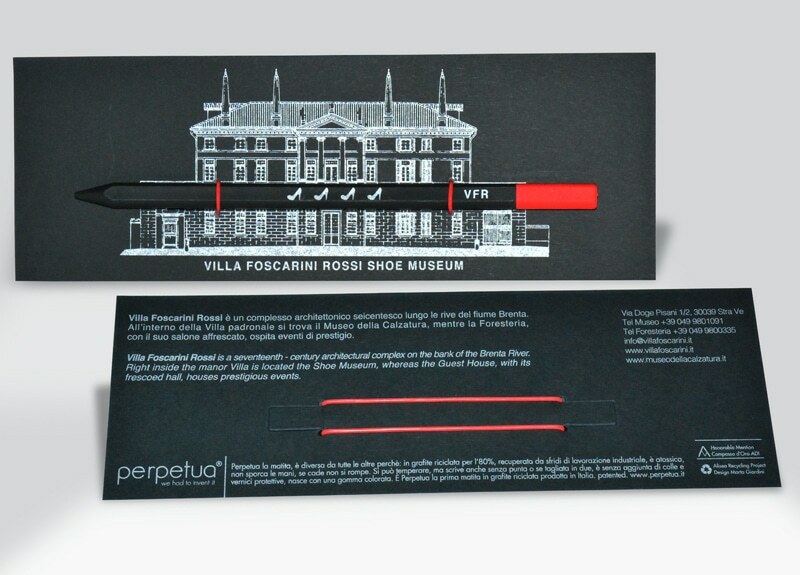 For the ECHO premier in Rome, Victor Perez chose Perpetua as business card to hand out to its private guests. 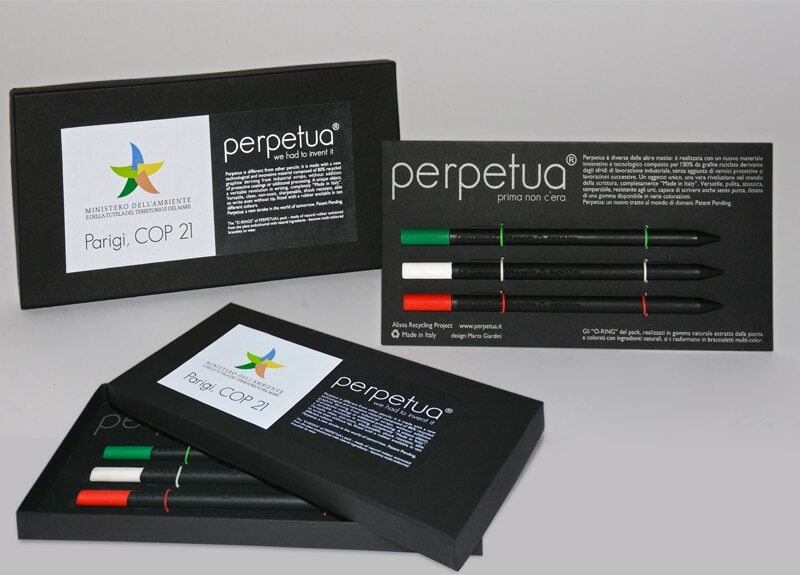 Perpetua the pencil was the message of innovation and sustainability given to the 300 national and international guests who attended the event. Perpetua will get “wet” on occasion of the World Swimming Championships, and will be coated with the autumn-winter 2017 graphics, from the swimsuits that will be worn by the Italian athletes. 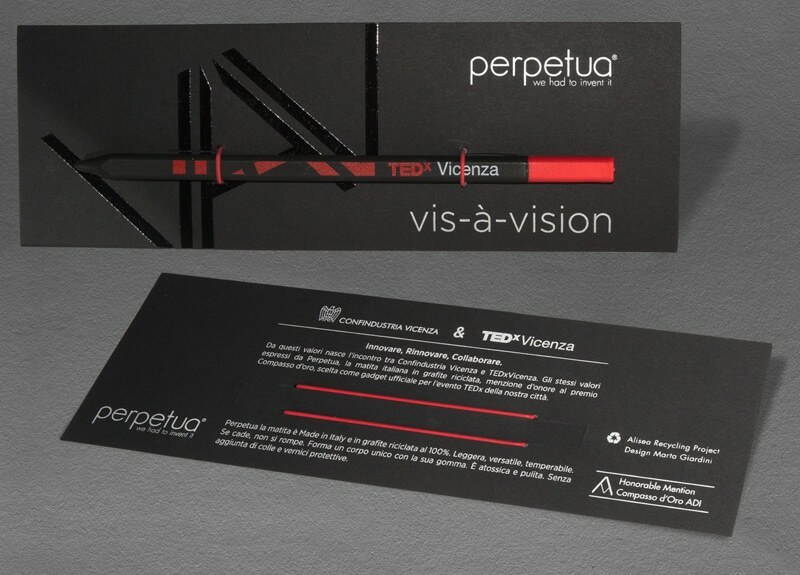 Perpetua in its customized version for the 2017 edition of TEDxVicenza. The Footwear Museum, Villa Foscarini Rossi in Padua, collects a collection of over 1700 models of luxury women’s shoes. 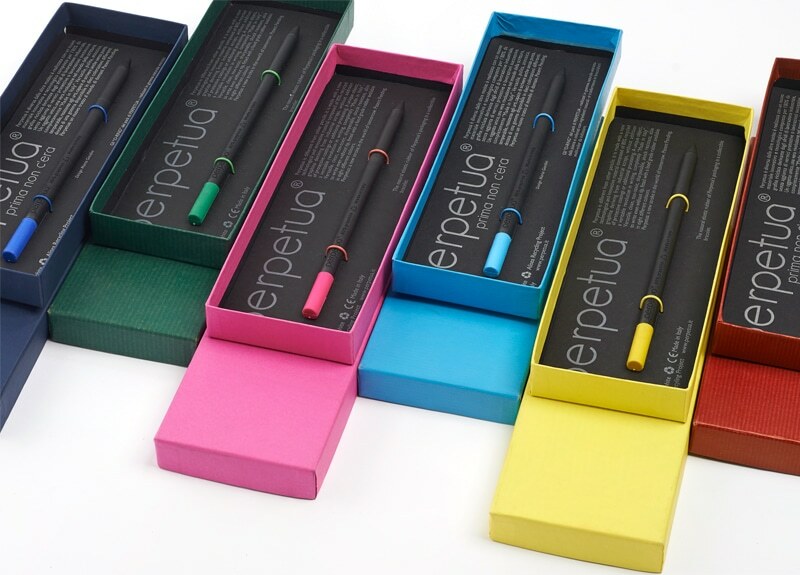 Customized packaging with four-color printing, Perpetua personalized in pad printing, white color. 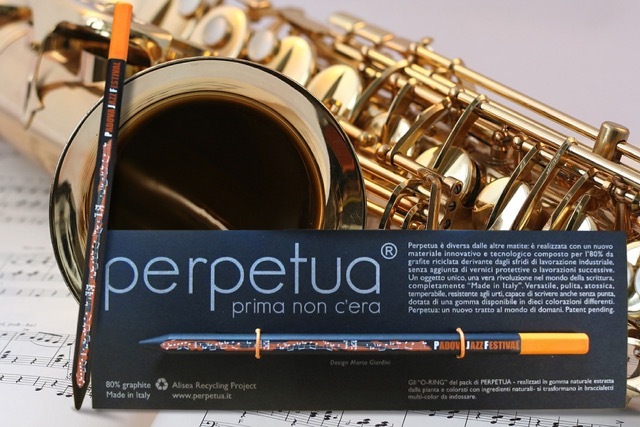 Perpetua dresses up in musical notes for Padova’s 18th Jazz Festival. A new limited edition is born. Starting today, also Padova Jazz will dispose by writing. 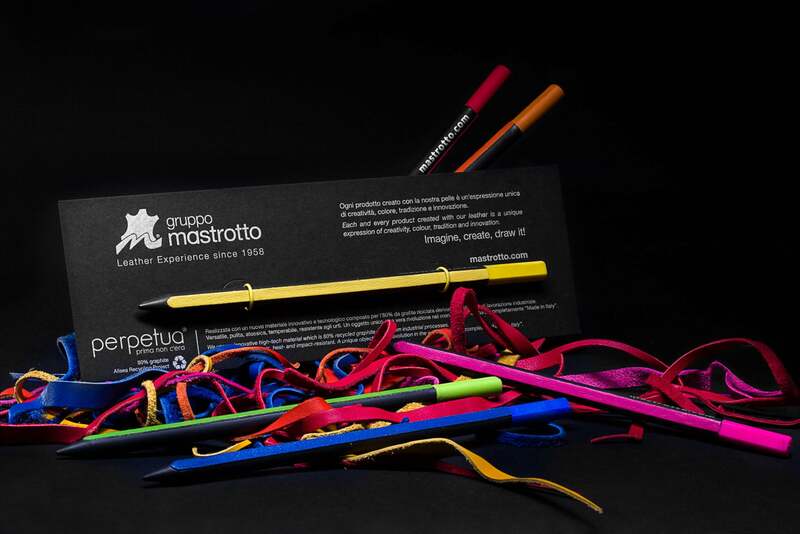 From the recovery of the scraps of processing of multicolor leather by Gruppo Mastrotto, Perpetua Re-use leather is born – because nothing has to be wasted! The application of coloured leather strips, combined with the various chromatic shades of the Perpetua rubber, is handcrafted by goldsmith artisans of the Vicenza district. 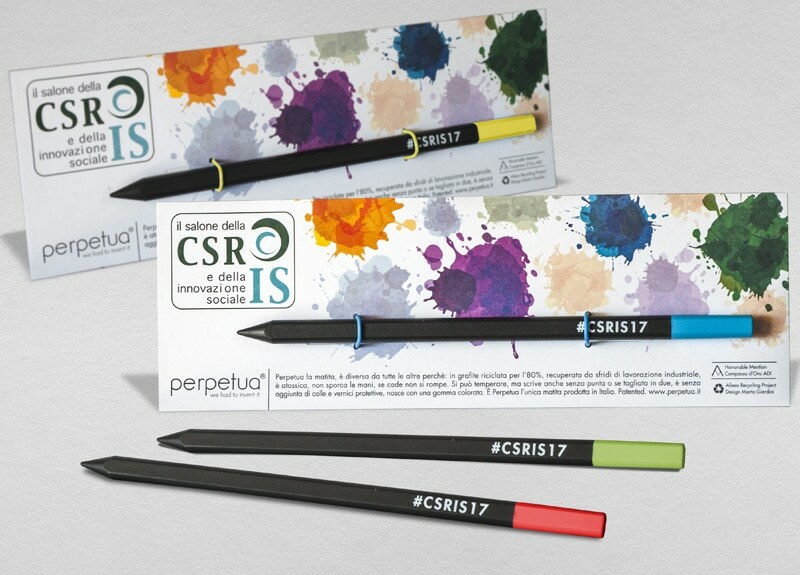 The passion for colours and Made in Italy quality design, uniting these two companies from Vicenza, finds life in this new special edition of Perpetua The Pencil. 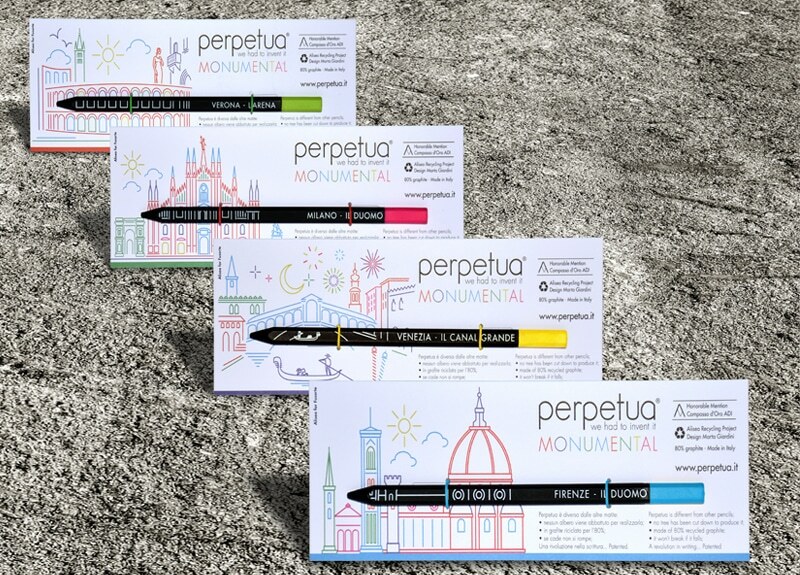 Perpetua Monumental is a project born in collaboration with Fusarte to celebrate, through Perpetua the pencil, the beauty of Italian historical architecture and the immense heritage that these masterpieces represent. 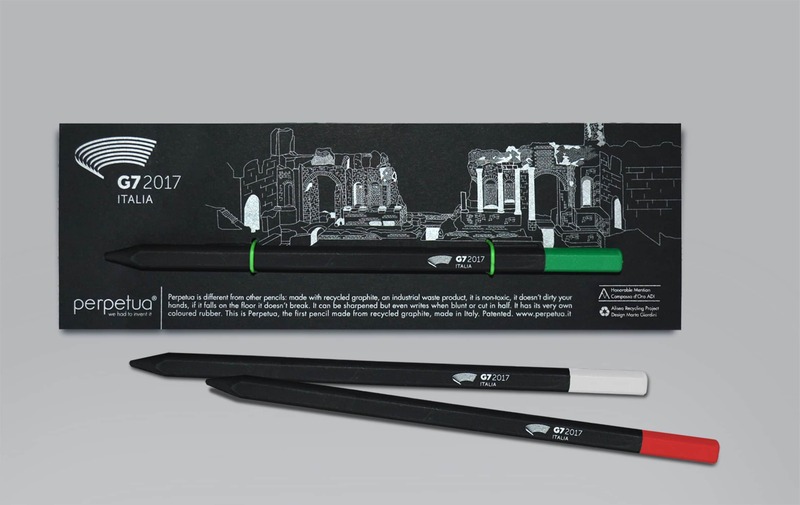 It is for those people who want lo live in a cleaner and healthier environment, it is for both left and right handed and for all of those who do not want to get their hands dirty when they write. 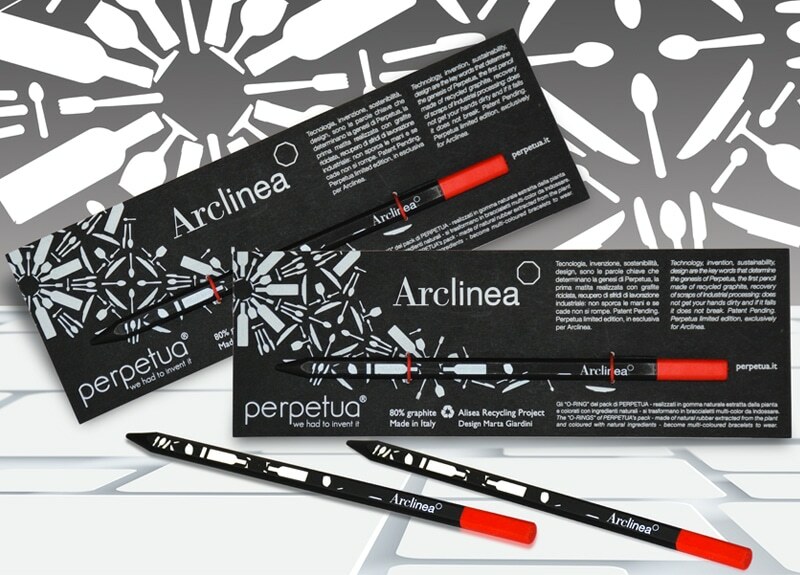 Perpetua-the pencil, by Alisea Recycled & Reused design, no tree has been cut down to produce Perpetua the pencil and no vanish coatings are used. 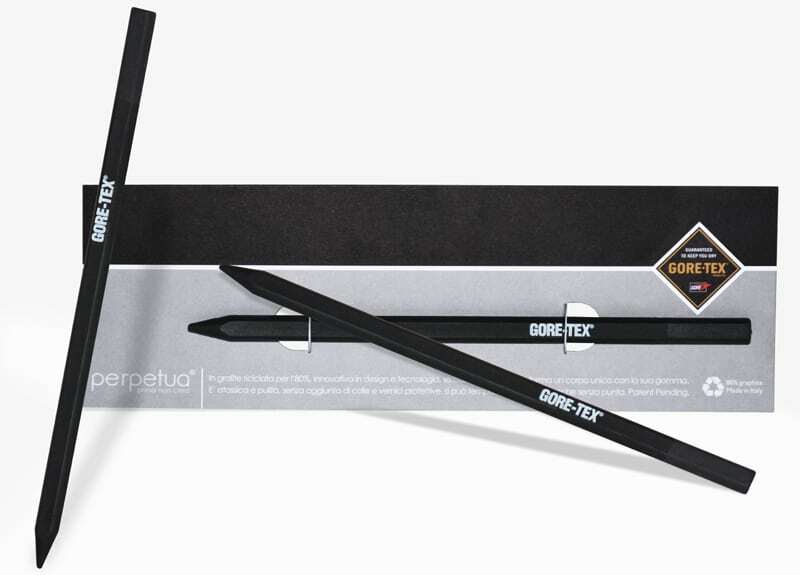 It is made of an innovative patented material, created with 80% recovered graphite that prevents it from getting your hands dirty. The question ‘Which hand do you write with?’ will be replaced by ‘which hand do you sharpen your Perpetua with?’. We thought about what would be the easiest way for you to sharpen it, creating two different sharpeners: the yellow one for the left handed and red sharpener for right handed. 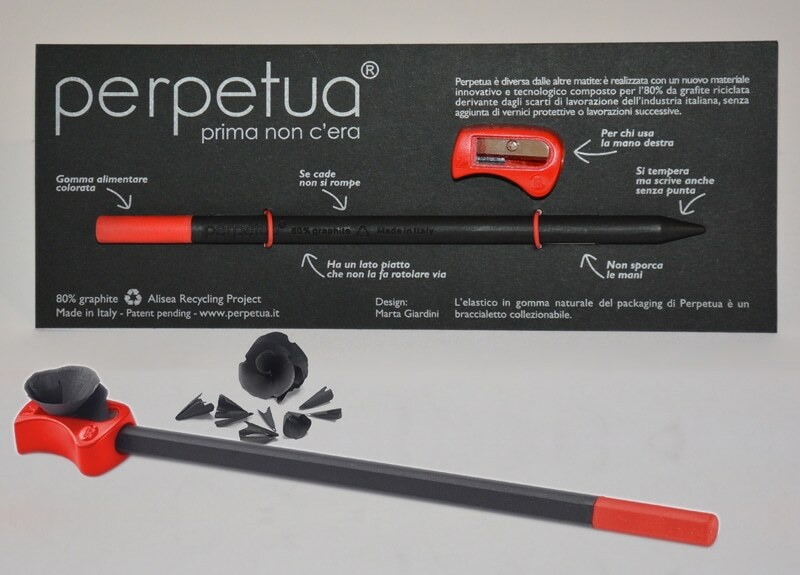 Perpetua The Pencil, with the red sharpener for the right handed. 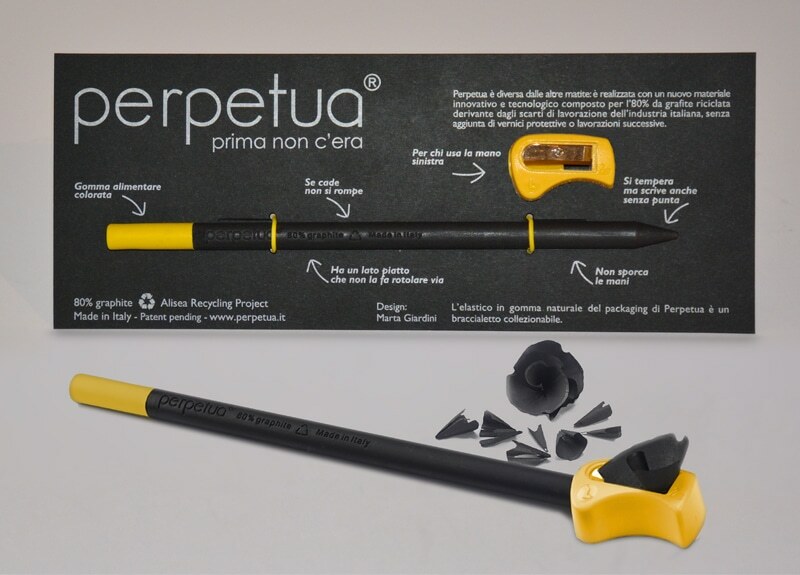 The color of the sharpener is the same as Perpetua’s top with “O-RINGs” made with natural rubber, extracted from the plant, and coloured with natural ingredients. 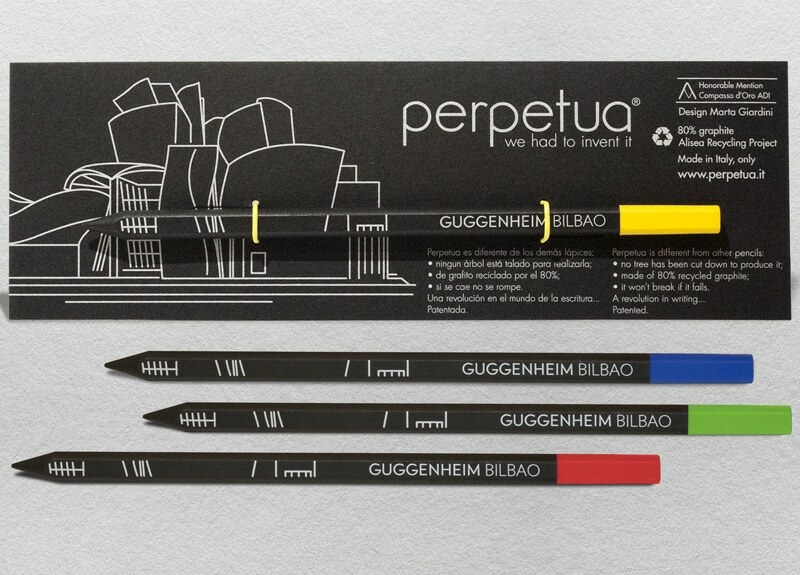 Perpetua The Pencil, with the yellow sharpener for the left handed. 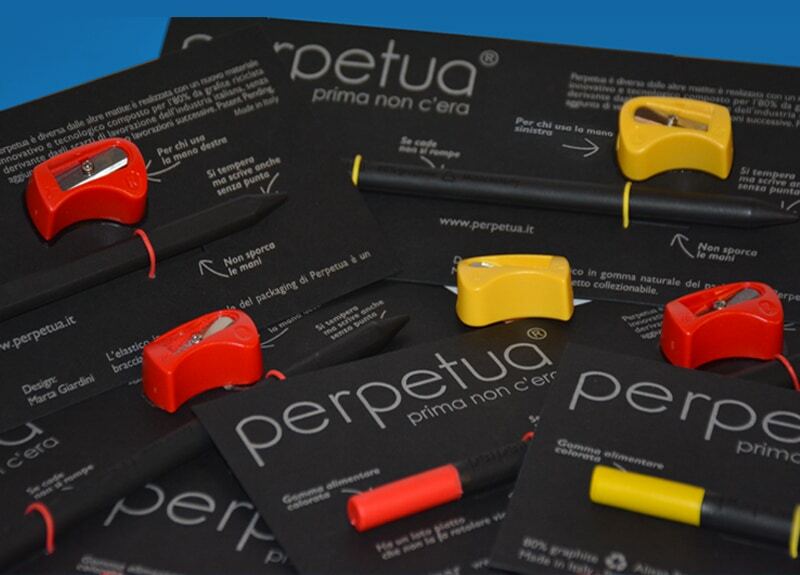 The color of the sharpener is the same as Perpetua’s top with “O-RINGs” made with natural rubber, extracted from the plant, and coloured with natural ingredients. 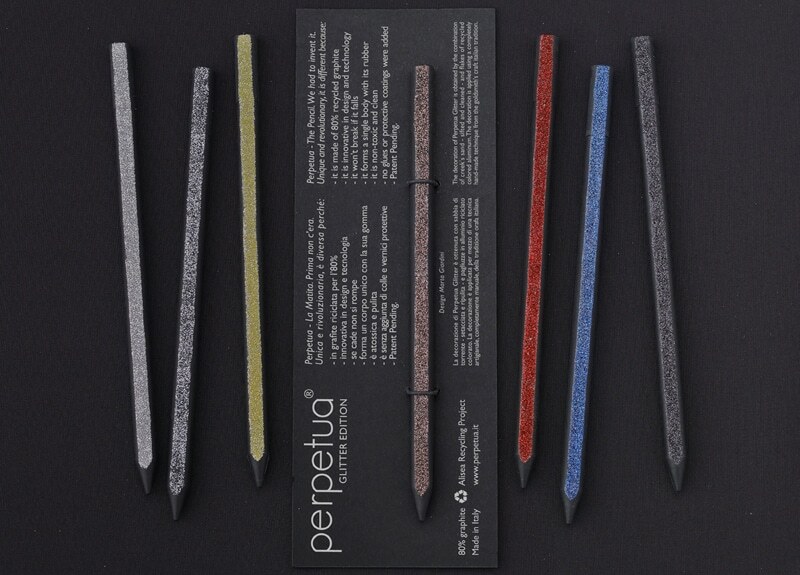 PERPETUA GLITTER EDITION – Perpetua The Pencil becomes a jewel. 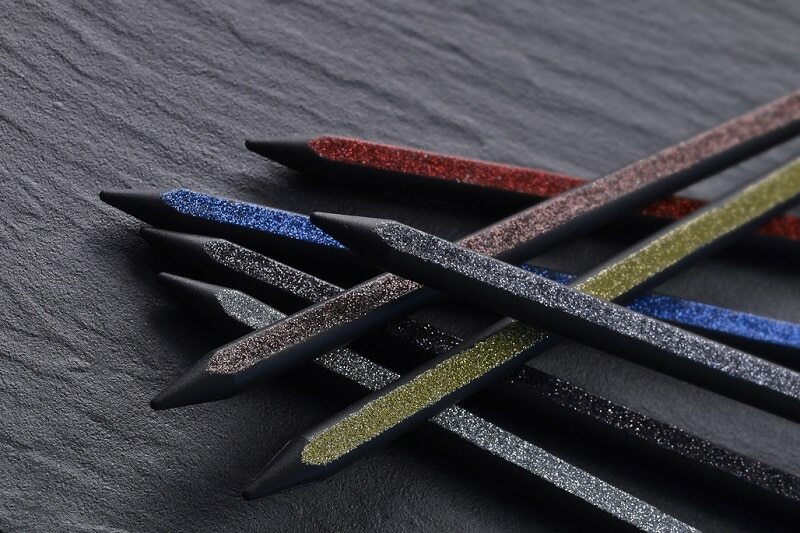 This time, PERPETUA surprises with the sparkling and original GLITTER EDITION look: the decoration of Perpetua Glitter is obtained by the combination of creek’s sand – sifted and cleaned – and flakes of recycled colored aluminum. The decoration is applied entirely by hand thanks to a technique from the Italian goldsmith’s craft tradition, the same used to make the pearls’ glazing. Nature, recycling and artisan know-how give life to a design object ideal for writing, perfect for an exclusive gift or to be collected. 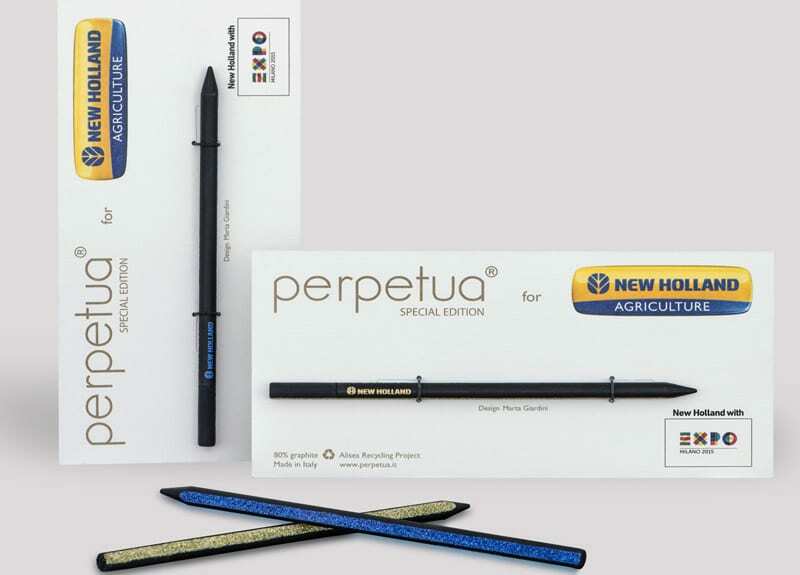 Perpetua Special Edition for EXPO 2015. 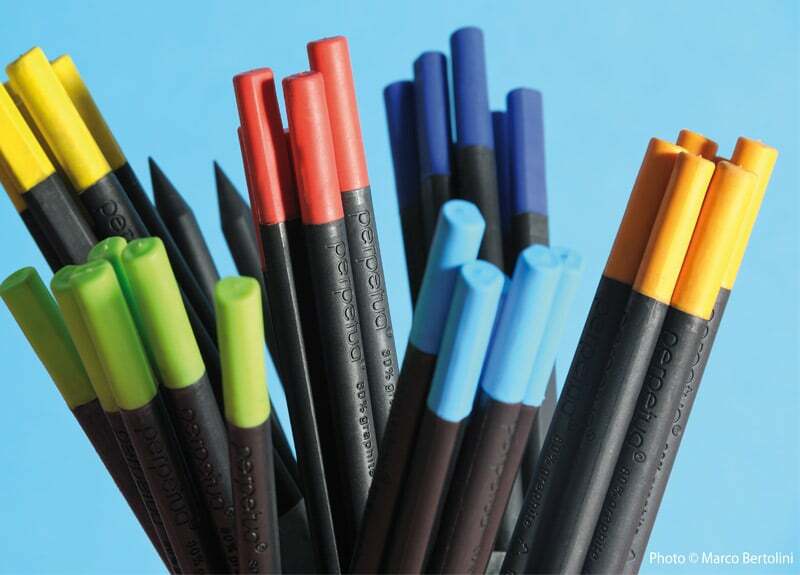 The “O-RINGs” are made of natural rubber, extracted from the plant, and coloured with natural ingredients. 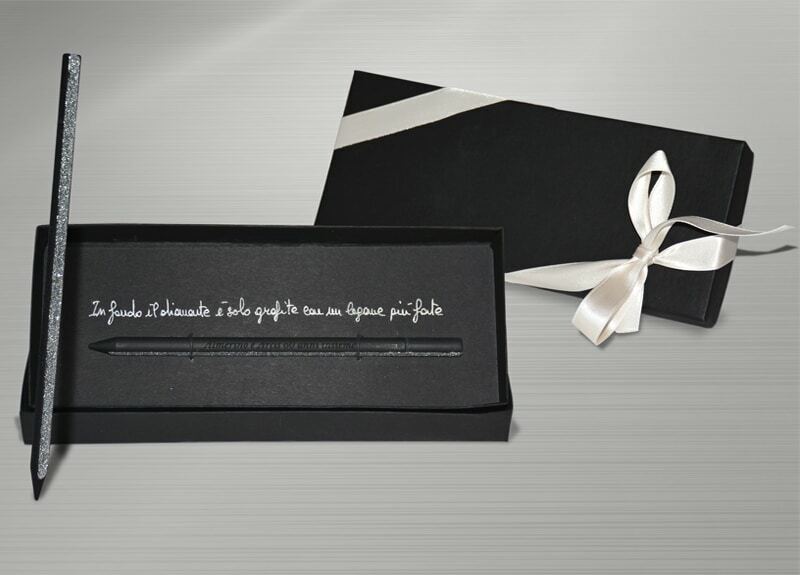 For the wedding of Christian and Laura, Perpetua – The Pencil Glitter Edition becomes an innovative bonbonniere, beautiful, ecological and trendy is the gift for all the guests. 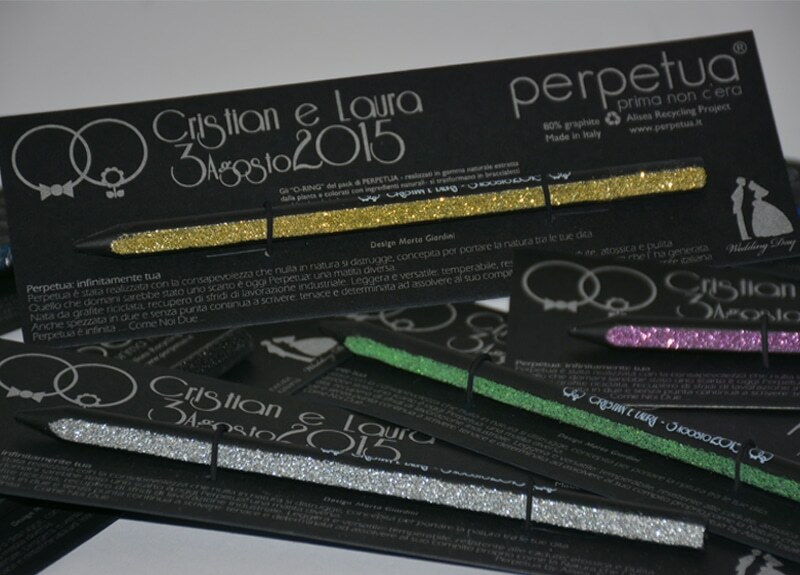 PERPETUA GLITTER EDITION is available in 7 color-decorations: gold, dark silver, light silver, bronze, red, blue and black. For the presentation to the press of #SognarEInnovare, a portal designed to tell stories of Italian innovation, to help give them visibility and give them the right value. 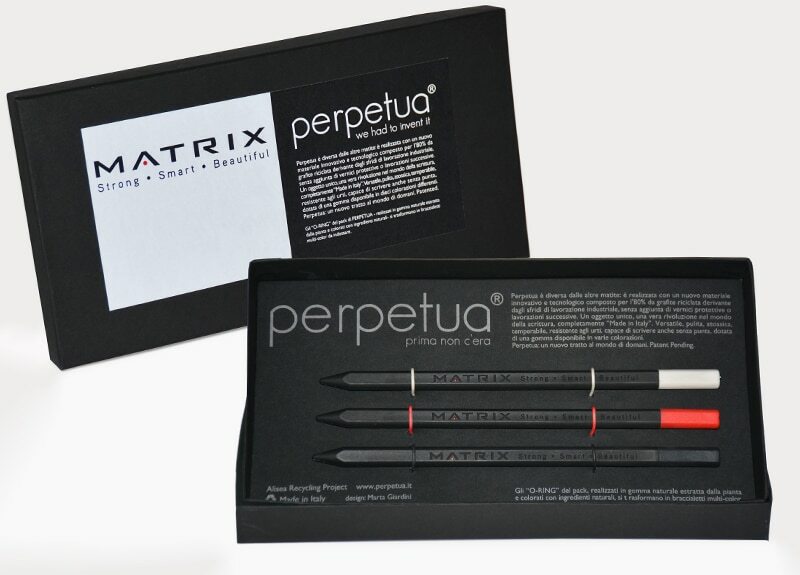 Perpetua has created a special packaging that also included a space dedicated to the insertion of a personalized USB stick. “After all, a diamond is just graphite with a much stronger bond”. Diamond Wedding Anniversary, 60 years together. 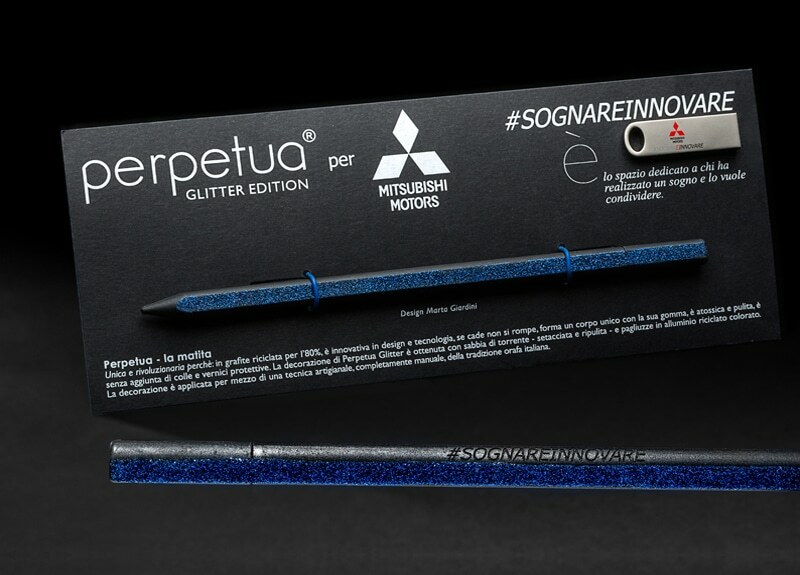 Perpetua Glitter Edition with laser engraving on graphite. HY-LITE is an innovative composite material made up of two thin sheets of aluminum wrapped around a white polypropylene center. Like steel, HY-LITE can be bent, drilled, cut, milled, sliced, printed and silk screen printed, but weighs 30% less than aluminum and 65% less than steel. 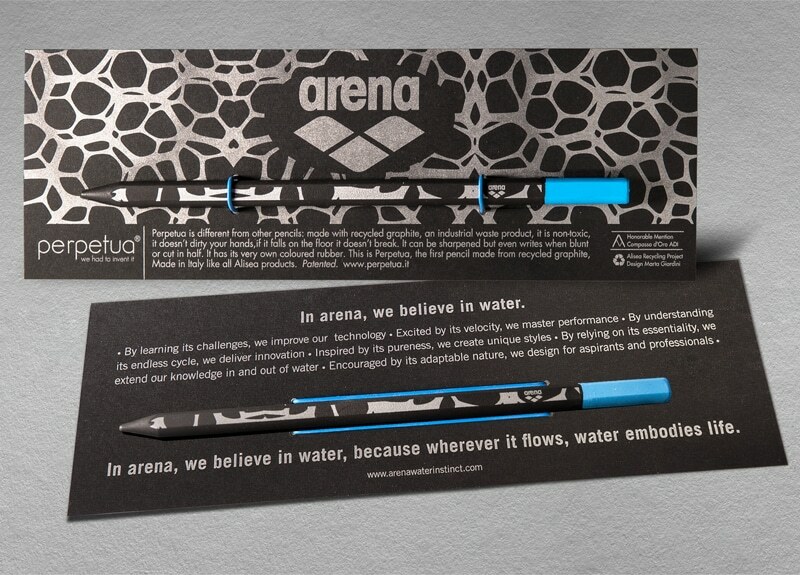 Customization with digital printing or screen printing, the entire surface, even inside. In order to celebrate the Italian Presidency of the Council of the European Union, the Italian Ministry of the Environment decided to give the EU Ministers and Commissioners Perpetua asan item that synthesizes the principles of sustainability, innovation and excellence Made in Italy. 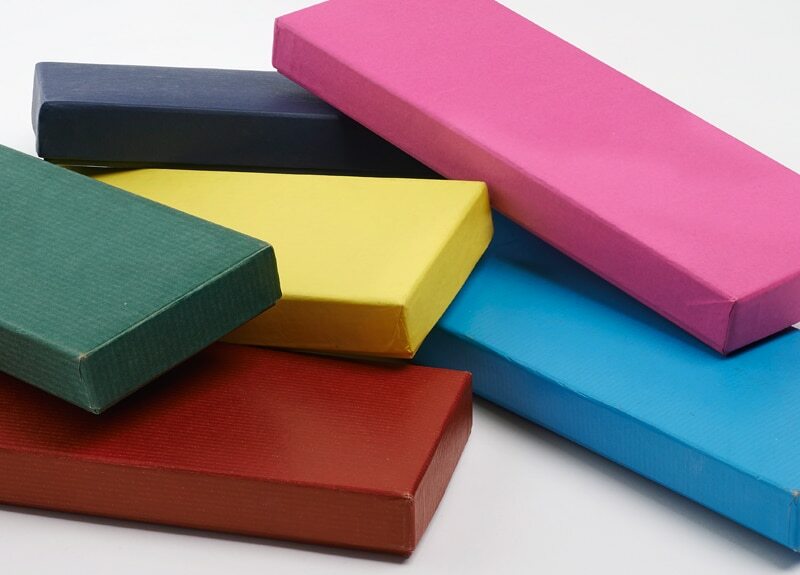 Colored and covered handmade cardboard boxes with cover. 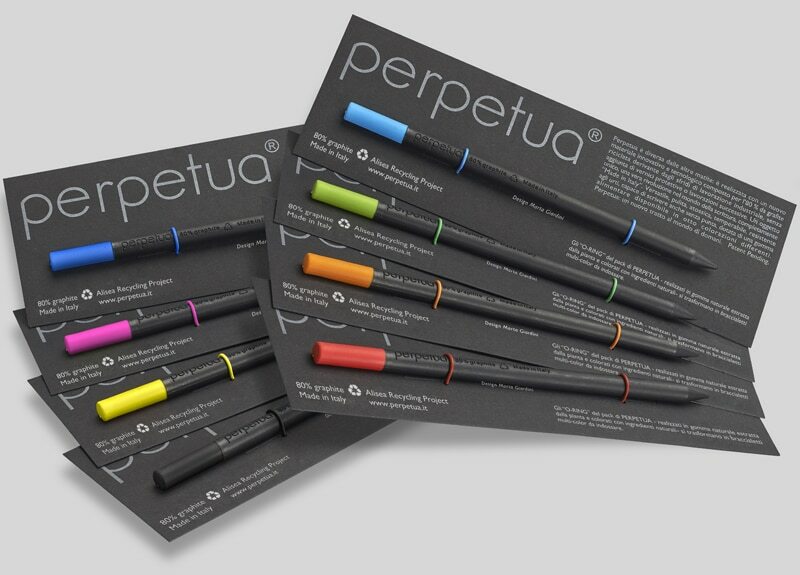 Available in 10 colors matched to the 10 different colors of Perpetua – The Pencil’s top. Customization with direct printing on the cover or label. Perpetua’s coloured top matched those of the company’s brand. Laser engraving on graphite and red glazing. 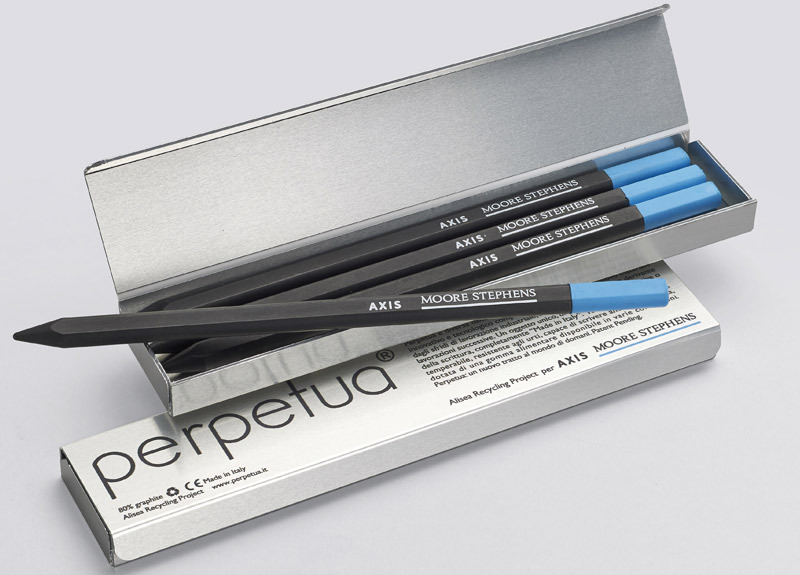 4 Perpetua pencils in a Hy-lite aluminum box. Customizable using white pad printing. For the 21st Climate World Conference in Paris.